Probably, the first thing that comes to your mind when you hear the word “school” is a big yellow bus. Still, not everyone is lucky to ride these comfortable vehicles! What about the other countries? Well, plenty of schools all over the world provide school buses for their students as well. Though those buses are not always yellow, but still they are pretty nice. Unfortunately, in some parts of the world school buses are considered to be luxury items, so obviously students have to get to school on foot or by other means of transport. For instance, some students from Philippines have to cross knee-deep rocky rivers on their way to school. So what are the extreme ways students get to school all over the world? The Typical Student team listed the MOST unusual morning trips to school worldwide. Take a look! 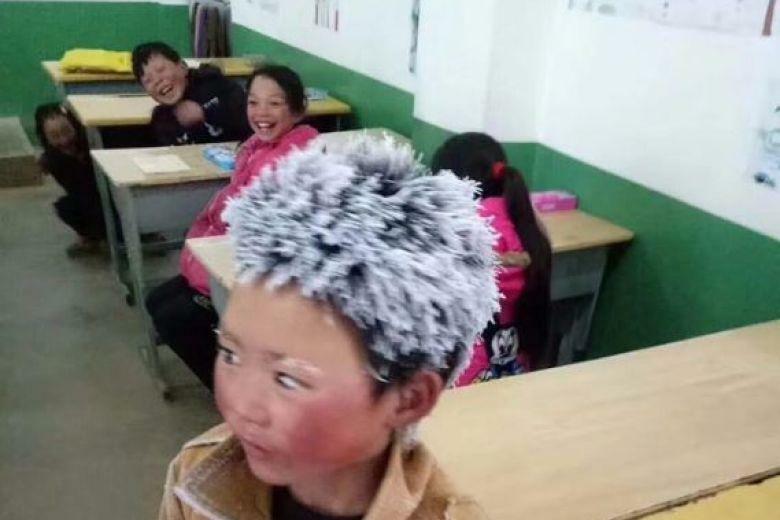 #1 A school boy from China walked 4km to school in extremely freezing conditions. The weather was so severe that the boy’s hair and eyebrows were covered with icicles. #2 This is how the way to school looks like in the Saudi Arabian town of Jazan. Kids have to climb these dangerous stairs in mountains, if they want to go to school. #3 Indonesian kids have to struggle with thick smog on their way to school. The air pollution in the country is so extreme that students can’t go outside without a mask. #4 Kids and their parents are walking to school in Guizhou province, China. #5 This is how school buses look like in Cairo, Egypt. #6 This is how a two-hour trip to school looks like in Liangshan Sichuan province, China. Students have to climb these extreme ladders in order to get to their school. #7 Indian students are going home from school in the horse cart. #8 This is how the students from Kashmir, India go to school every morning. #9 School girls from Sri Lanka are going to school. #10 Heavy rains in some regions of India often flood the roads, so many kids have to go to school by boats. #11 Japanese students, who live near the Fukushima Daiichi nuclear power plant, are facing with Geiger counters that are ticking off the local radiation levels. #12 This is how Indonesian students cross the river on their way to school. #13 Filipino kids are using the bamboo homemade rafts in order to get to their school. #14 Other Philippine students are crossing knee-deep rocky river on their way to school. #15 Students from Banten province, Indonesia are traveling to school by boat. #16 Other Indonesian kids are less lucky and they have to go to school by the smaller boats. #17 Some students in Banten province don’t have any boats at all. #18 Those Indonesian kids who can’t reach their school by boat use the collapsed bridges. #19 Kids in Rizal, Philippines are crossing the river on the inflated tire tube. #20 Children in Jiangxi Province, China are going to school accompanied by their father. #21 This is how the way to school looks like in Henan province, China. #22 Kids in Tokyo are wearing their protective headgears in case of a natural disaster on their way to school. Why “Typical” Temp Dorms At Purdue University Look More Like Prison or Boot Camp?